Top Notes: Bergamot, Milk, Coconut. Heart Notes: Vanilla, Ylang-Ylang, Peach. Base Notes: Cedar, Patchouli, Caramel. Infuse a luxurious fragrance into your abode with the Filorga Candle; a single wick candle housed in an elegant black container. Notes of fresh Bergamot, Milk and Coconut are blended with creamy Vanilla, soft Peach and Ylang-Ylang, whilst warm Cedar, Patchouli and Caramel form the base. 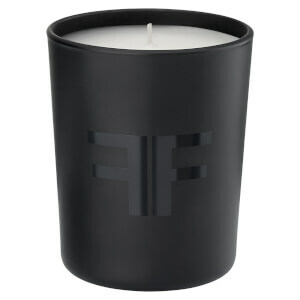 Simply light the candle to help lift your mood and restore a sense of well-being. Let the candle burn at least 2 hours for the first time. Never put the candle directly on a marble or glass surface. If on skin: wash with plenty of soap and water. If skin irritation or rash occurs, seek medical advice. Do not let the candle burn while you are away. Do not leave within the reach of children or pets. Do not leave flammable objects near the candle. Do not let the candle burn more than 4 hours. Extinguish the candle with an object adapted for this purpose. Stop the candle before 1cm of the end of the wax. Don't put two candles next to each other within less than 10cm. May produce allergic reaction. Butylphenyl Methylproponial, Linalol, Coumarine, Cedryl Methyl Ketone, Bergamot, Huile, Vanilline, Salicylate de Benzyle.